Carnegie Museum of Natural History’s collection includes 2855 specimens from India, mostly collected by Carl Gans and collaborators from the National Museum of Natural History in Delhi. The museum was home to invaluable collections and played a crucial role in environmental education in a country suffering of rampant habitat destruction. This is a great loss for nature lovers and for the museum world but also a particular tragedy for the Carnegie Museum of Natural History. The Carnegie has an important historical connection with the museum in Delhi, for during the early stages of its development, curatorial staff from the Carnegie helped to train museum personnel and build their collections. We have selected some items from the herpetology collection and archives to pay homage to the National Museum in Delhi and express our support and condolences to our colleagues in India. 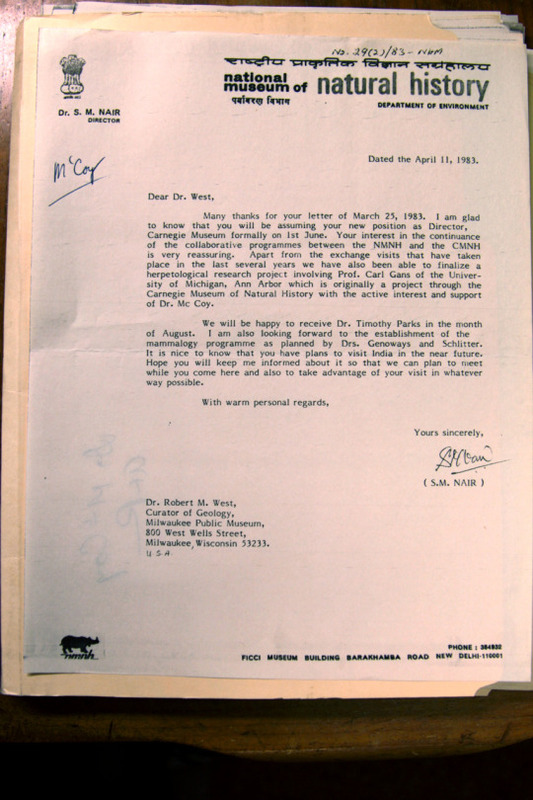 Letter dated April 11, 1983, written by Dr. Nair, director of the National Museum of Natural History in Delhi, and addressed to Dr. Robert M. West, Curator of Geology at the Milwaukee Public Museum, who was about to become director of the Carnegie Museum of Natural History. The letter mentions ongoing collaborations between the two museums, especially in the area of herpetology under the supervision of Dr. Jack McCoy and Dr. Carl Gans. Museum tags for the National Museum of Natural History in Delhi ordered by Carnegie Curator of Amphibians and Reptiles Jack McCoy and fabricated in the US by the National Tag Company. José Padial is the William and Ingrid Rea Assistant Curator of Herpetology at Carnegie Museum of Natural History. He most recently traveled to the remote Vilcabamba mountains of Peru in the pursuit of biodiversity research. Read more at www.tumblr.com/blog/expeditions-carnegiemnh.